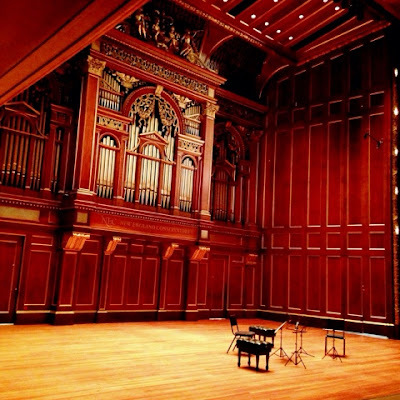 A while back, in early December, I was lucky enough to see Takacs Quartet perform at New England Conservatory's Jordan Hall as part of the Celebrity Series of Boston. No pictures are allowed during the performance but I was able to take this photo beforehand, which shows off the beautiful venue and the intimate setting from a quartet performance. My friend and I noticed, though, that we were one of the few "young people" and we're both in our 30s (so not really young). Was it because Classical music just doesn't appeal to a younger audience? But then I remembered attending the free performance of "A Midsummer Night's Dream" at the Hatch Shell featuring the Commonwealth Shakespeare Company performing the play and the Landmark Orchestra performing Mendellsohn's inspired composition. That was as crowded as you can get with a very diverse age range. So, I think it's a matter of cost. The younger people would probably go to the performances, if they could afford it. And if they were in the audience, there might be less nose crinkling over the avant garde Modernist composers.